Enheduanna also En-hedu-Ana; (c. twenty-third century B.C.E.) was an Akkadian princess and high priestess who was perhaps the earliest known writer in history. Identified as a daughter of King Sargon I, she was appointed high priestess of the moon god Nanna (Sîn) in his holy city of Ur. She became the most important religious figure of her day, and her evocative prayers, stories, and incantations, which were devoted to the goddess Inanna (Ishtar), were highly influential. She has been dubbed the "Shakespeare of Sumerian literature." Enheduanna's writing was both sophisticated and extremely personal. She was the first known author to write in the first person, doing so in a way which displayed her unique religious sensibilities and spirituality. She traveled widely, writing hymns extolling the virtues of many temples. She also survived being deposed and exiled, later returning to her position at Ur sacred temple. Her writings were copied for centuries, and her influence is believed to have assisted in the merging of the Akkadian Ishtar with the Sumerian Inanna. Despite living more than 4,300 years before the present, Enheduanna's historical existence is well established. Her mother was Sumerian, probably herself a priestess who hailed from southern Mesopotamia. 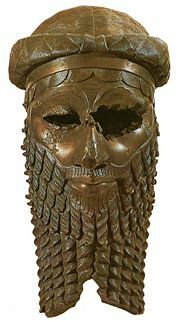 Her father, it is generally agreed, was Sargon of Akkad, who was also the son of a priestess, perhaps a sacred harlot, since he admits not knowing the identity of his father. Enheduanna's name—EN.HÉ.DU.AN.NA 𒂗𒃶𒁺𒀭𒈾—means "Lady Ornament of An." As the high priestess of the moon god Sin or Suen (also called Nanna), she seems to have served at both the great Eanna temple complex in Uruk and Nanna's sacred city of Ur. The alabaster disk which includes her image is currently on displayed at the University Museum in Philadelphia. It depicts her in a religious procession, in which she is preceded by a male priest with two male attendants behind her. Enheduanna wears a ruffled dress and a brimmed turban, a sign of her office. On the back of Enheduanna's disk is an inscription recording her as the "daughter of Sargon of Akkad," the founder of the Dynasty of Akkad and the first ruler to unite northern and southern Mesopotamia, who reigned for 56 years, c. 2270–2215 B.C.E. Scholars have debated whether to take this relationship literally or symbolically. If literally true, it attests to Sargon's successful policy of appointing members of his family to key posts. Moreover, there followed after Enheduanna a long tradition whereby the king appointed his daughter to the post of high priestess of Nanna, leading many scholars to conclude that Enheduanna was indeed the first of such royal daughters to be appointed to this position. Although she was the priestess of Sin/Nanna, Enheduanna's most famous work is her Nin-me-sara, devoted to the goddess Inanna/Ishtar. This is not altogether surprising, since Ishtar is often portrayed as the daughter of Nanna. 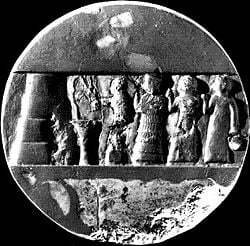 In this work Enheduanna calls on Sin and Inanna for help because she has been dislodged from her position by a rebelling Sumerian king, Lugal-Ane, who, she complains, did not show proper respect for the gods and has desecrated the Eanna temple at Uruk. Many scholars perceive political themes woven into Enheduanna's writings, motivated by her support of Sargon's imperial legacy. Sin, tell An about Lugal-ane and my fate!… En-hedu-ana will recite a prayer to you. To you, holy Inanna I shall give free vent to my tears like sweet beer!… Lugal-ane has altered everything and has stripped An of the E-ana (temple). He has not stood in awe of the greatest deity. He has turned that temple, whose attractions were inexhaustible, whose beauty was endless, into a desolation (Nin-me-sharra 74-90). Her prayers to Inanna were answered with victories in battle, putting down the rebellion. This allowed her royal nephew, Naram Sin, to successfully unite Sumer and Akkad for several years. As a result, Enheduanna was restored to her post as priestess of Nanna. Nin-me-sara was long revered as a sacred scripture in Sumerian literature. As long as 500 years after her death, during the Babylonian era, it was used as a text copied by students learning to be scribes in the edubba, or scribal schools. More than 100 clay tablet copies of the hymn have been found, testifying to its popularity. Few Mesopotamian literary texts have boasted as many copies. On her alabaster disk, En-hedu-anna styles herself the "zirru of Nanna," a mysterious term which may translated as "wife of Nanna," possibly referring to her as an embodiment of the goddess Ningal, who was Nanna's consort. Ishtar as a warrior goddess. Enheduanna is known as the author of several early Sumerian hymns. Nin-me-sara, also called "The Exhaltation of Inanna," consists of 153 lines. The first 65 lines address the goddess with a list of epithets. Enheduanna complains that she has been deposed and asks for intercession of Nanna, the goddess' father. Lines 122-135 recite divine attributes of Inanna. In-nin sa-gur-ra (named by incipit), 274 lines (incomplete), edited by Sjoberg (1976) using 29 fragments. In-nin me-hus-a, the myth of "Inanna and Ebih," first translated by Limet (1969). 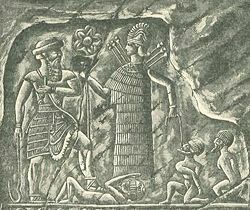 Here, the goddess, presented primarily as a goddess of war, defeats the mountain (or country) of Ebih, which has refused to worship her properly. The Temple Hymns, edited by Sjoberg and Bergmann (1969): 42 hymns of varying length, extolling the virtues of various temples. Hymn to Ianna, a 274-line devotional hymn to Inanna as the "Lady of the Great Heart." Enheduanna is the first known author to write in the first person. Scribes had previously written about the king and the the gods, but never about themselves or their feelings toward their deities. My Lady, I will proclaim your greatness in all lands and your glory! I am yours! It will always be so! Desirability and arousal, goods and property are yours, Inanna. Gain, profit, great wealth and greater wealth are yours, Inanna. Gaining wealth and having success in wealth, financial loss and reduced wealth are yours, Inanna. Observation, choice, offering, inspection and approval are yours, Inanna. Assigning virility, dignity, guardian angels, protective deities and cult centers are yours, Inanna (Hymn to Inanna 115-131). The ziggurat of Ur was devoted to the worship of Nanna and Ishtar about a century after Enheduanna's time. Enheduanna began a long tradition of Mesopotamian princesses serving as high priestesses. Her hymns were copied by scribes for at least five centuries, and her writings are believed to have influenced the merger of the Sumerian Inanna with the Akkadian Ishtar. After her death, a hymn was devoted to her by an anonymous composer, indicating that she may even have been venerated as a deity herself. A number of recent studies are devoted to Enheduanna. Cass Dalglish of Augsberg College, for example, recently published a new, poetic translation of Nin-me-sara, under the title Humming the Blues. It utilizes a unique approach to cuneiform translation, taking the multiple meanings of each symbol into account in order to arrive at a more comprehensive understanding of the Enheduanna's themes and motifs. Although shrouded in the mists of an ancient culture, Enheduanna's importance is likely to rise in stature. She is, after all, probably the world's oldest known author as well as a figure who evidences a significant role of women in the history of literature. Dalglish, Cass, and Enheduanna. Humming the Blues. Corvallis, OR: CALYX Books, 2008. ISBN 9780934971928. Enheduanna, and Betty De Shong Meador. Inanna, Lady of Largest Heart: Poems of the Sumerian High Priestess Enheduanna. Austin: University of Texas Press, 2000. ISBN 0292752423. —. Princess, Priestess, Poet: The Sumerian Temple Hymns of Enheduanna. Austin: University of Texas Press, 2009. ISBN 9780292719323. This page was last modified on 23 August 2017, at 16:58.